Just a while ago, YASU, who provided several classic guitar pieces for the game, informed me that he uploaded a video of the Ib ending theme (Departure), which I shall share with you. For those who haven't seen the ending, I recommend listening to it after you do if possible! It's wonderful on every listen. While I'm at it, I decided today shall be a day to write about music and sound effects. It's all reminiscing on Ib's creation, so it might not be very interesting... additionally, it's long. But for those who are interested, continue. I only began searching in earnest for music to use in Ib when the game itself was about 90% complete. Until that point, I made do with RTP resources and songs from other games. Of course, I would have to make up my mind soon, so I scoured the net for music that would suit the world of Ib. The process took about a week in total. Three days of going around visiting music sites and checking out promising songs, three days deciding what I could use from those, and the remaining day for making my final decisions. Each site had such wonderful music, and I ended up listening to lots of songs that I knew wouldn't work at all. I primarily picked songs that fit with Ib's "quietness" theme. Additionally, I associated Ib with piano, Garry with classic guitar, and Mary with music boxes, and searched for music that fit with those. Ib's piano was used for the main exploration parts. I was satisfied with any music that was suitably eerie and didn't distract from the exploring. I asked the aforementioned YASU to handle all of Garry's guitar. None of it was original material, but still, he accepted my earnest request... Thank you very much. The search for Mary's music box was troublesome... Surprisingly, nothing seemed to fit her character. There was a lot of good stuff, certainly, but it just didn't fit in a game... hmm. As much time as it took, though, at least I found good songs in the end! Hooray! So that was how I decided on the music. Also, I definitely wanted the music in the gallery to be classical, so I used "La Folia." If there's anyone reading who's learning the violin, perhaps you may be familiar with it! To break up the text, have a Garry. 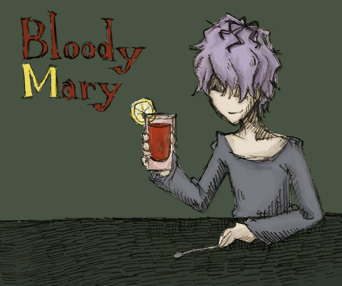 He's holding a Bloody Mary, as stated. A tomato juice cocktail. Now, about the sound effects. In a way, it was harder to find sound effects than music. To simply answer why, it's just because there's more of it. I wanted the sounds to be as realistic as possible, so I primarily used the site "Koukaongen." Their sounds are recorded live, so the footsteps and such sound very real. Speaking of footsteps, one thing I had in mind from the start was "being in a dark gallery with only the sound of Ib's footsteps echoing." When I at last put them in, the footsteps were just annoying... A surprising phenomenon! ...So I made it silent in the end. Instead (? ), I had the sound of other people's footsteps. Other than that, I also applied reverb to all the sound effects in the dark Guertena exhibit, to make it sound like they were echoing inside a building. Listen for it if you wish. I wanted to avoid using as many default (RTP) things as possible, only using what I found. The sound of the spitting painting is the same way, for the same reasons. Gathering up sound effects in this way helped to broaden the world of Ib. Putting sound alongside the art is an extremely important element, so I'm truly grateful to everyone who provided music and sounds. One unfortunate thing, though, is that I paid no attention at all to filesize while making my sound decisions. I'm truly sorry. The music takes up a lot of space... Even people overseas have been bugging me about it. Also, one more thing. Which is annoying, but I'll keep saying it. Please stop uploading the music onto the internet as-is. "Modification, misappropriation, and distribution of any data used in the game is forbidden. The music and sound effects, in particular, are being used with permission from their respective creators. Unfortunately, I've had reports of many people who are neglecting to follow the guidelines. If the situation doesn't seem to be changing, I may have to alter them. But I don't want to have to make them more strict. If you know anyone who isn't aware of this, please tell them gently. I've giving this warning because I want to avert it as much as I can. This is a plea from the author. It may not do any good saying it here, but... please. Well, that's about it for this long post.